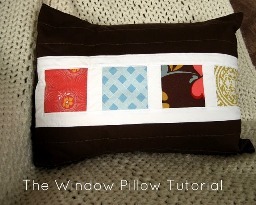 Chris from Pickup Some Creativity shares a tutorial on her blog for making her Window Pillow. The patchwork pillow frames squares of four different fabric prints. This was part of her Boudoir Pillow entry in last week’s So You Think You’re Crafty under the Dress Up theme. (She used the pillow to “dress up” her bedding.) Go to the tutorial.